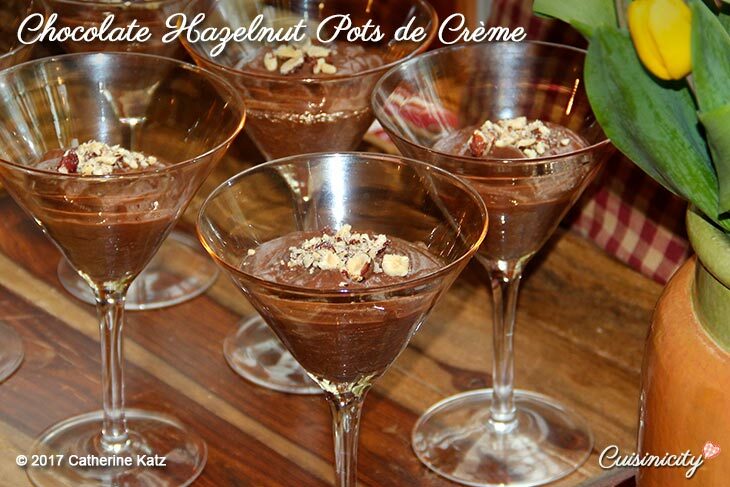 These luscious pots de crème are a no-bake variation of my famous original Crème au Chocolat. They add the sweet nutty taste of hazelnuts! If you love nutella, as most French people do–in fact they are obsessed (! )–you will absolutely LOVE these, c’est un régal ! Of course they are much healthier (not all that added sugar) and sustainable (no palm oil of course) and nutritious at that: Just take a look at the wholesome simple plant-based ingredients that I use, I am amazed myself! I like to serve these in beautiful champagne flutes or tall martini glasses to add a note of elegance to the whole experience!! I prefer using dry roasted unsalted hazelnuts because they impart more flavor but raw hazelnuts will work as well. 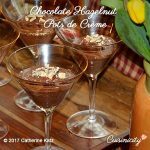 Place all the ingredients in a blender (except for the chopped hazelnuts for the topping) and process for 1-2 minutes until smooth. Pour the custard in individual containers of your choice, I love using champagne glasses and filling them half way. Top with chopped or crushed hazelnuts. Refrigerate and serve cool or at room temperature. Wow looks so decadent and delicious!! Yum!!! Hi Catherine, I will definitely try making this, it sounds delicious! I have been seeing Palm Oil in so many products and I avoid it because I’ve heard it’s not healthy. Can you explain why it’s not healthy and also explain the sustainable part? Also, do you use the coconut milk from a can or the kind in the refrigerated section that comes in containers like milk cartons? Thank you! This dessert looks regal enough for special company! Okay it actually would make me feel special. You’re amazing Catherine. Although it’s just me +4 dogs in my household, I’m truly going to try this one. Wow you’ve outdone yourself I feel. Oh and please say hello and my best to Susan K. I miss her news and other things. But I wish only the best to and for her! I can’t wait to try this. I just need to do a little shopping first.